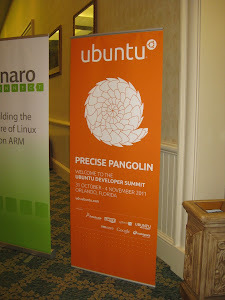 The Ubuntu Developer Summit for Precise has ended yesterday, so here is short list of possible changes in Ubuntu 12.04 Precise Pangolin. Ubuntu will promote 64-bit images starting with Precise. This means that when you go to Ubuntu.com and click to download Ubuntu, the 64-bit image will be selected by default. You can of course choose to download 32-bit images instead if you want to. Until now, the 64-bit images weren't promoted due to the lack of multiarch support, but with this problem solved, there's nothing blocking it anymore. The Ubuntu 12.04 Precise Pangolin ISO size will increase to 750MB which means it won't fit on a CD anymore so you'll need either an USB stick or DVD. There were issues the last cycle with fitting everything on the CD so this is a welcome change for the developers. The reason only 50MB were added is to make sure there's not too much stuff added on the ISO just because it's possible. Unity Greeter improvements: LightDM will use the wallpaper the user sets for the greeter and other info might be exposed to the greeter as well, by connecting it with the messaging indicator. Also, the Unity Greeter (via LightDM) will be used as the lock screen. There were also discussions about signing in to Ubuntu using with Ubuntu One credentials or Facebook account. This would be especially useful for OEM to get rid of the "creating user account" step. But, durring the discussion, there were many potential issues raised, most importantly: the need to be connected to the Internet to be able to log in. The Ubuntu Software Center will get a huge list of improvements. Most importantly: while currently the startup time is around 11.2s, the goal for Precise is a value under 2s. Also, at the end of the "View" menu will be a checkbox: "New Applications in Launcher" which will automatically add newly installed applications to the Unity launcher. Some missing Synaptic features should also be added to Ubuntu Software Center, such as reinstall, update, pin a version. - Unity 2D should use the Unity window decoration buttons for maximized windows. Overlay Scrollbars need to be ported to xul (Firefox, Thunderbird), vcl (LibreOffice), swing (Java) and nux. The Qt port is already in progress but there's no news about the others for now. Wayland might be available as a tech preview for Ubuntu 12.04 Precise Pangolin, however, this is a low priority task. There are many things that need work to be able to optionally install Wayland: write a Wayland compositor, patch LightDM to support Wayland, PolicyKit/screensaver/lock screen support and more. Banshee will probably be replaced by Rhythmbox as the default music player in Ubuntu 12.04. Since Tomboy and Gbrany are the only applications that still use Mono, they will dropped from the ISO too, meaning Ubuntu 12.04 might be Mono-free. Vinagre, tsclient and rdesktop will probably be replaced with Remmina and FreeRDP. "tsclient is a UI front-end for rdesktop (and was dropped by default for 11.10). Vinagre is a UI front-end for RDP (rdesktop currently), VNC and SSH. Remmina is a UI front-end for FreeRDP, and supports RDP, VNC, NX, XDMCP and SSH"
The reason for this is that rdesktop is not actively maintained, Remmina uses a better UI than Vinagre and supports the same features and GNOME might switch from Vinagre to Boxes (check out Boxes here). By the way, you can find a FreeRDP PPA here. Zeitgeist Activity Log Manager might be integrated into Control Center, so you can blacklist folders or applications or clear the Zeitgeist history which is important for privacy reasons. PiTiVi video editor, GNOME Sushi and GNOME Documents were proposed but were rejected from being included by default in Ubuntu 12.04. Lubuntu: LightDM will be enabled by default for Alpha 1. Lubuntu Software Center will also be added by default, but Synaptic won't be removed. And finally, Viewnior will be set as the default image viewer for Lubuntu 12.04 Precise Pangolin. Kubuntu: LightDM will replace KDM and there will be a nice Plasma theme for LightDM. Also, low fat settings will be turned on by default; this is a package designed to reduce memory usage by up to 32% and reduce KDE’s startup time by 33%. And finally, the Kubuntu devs are also considering replacing Kopete with KDE-Telepathy by default. Unfortunately there was no Xubuntu session (or I've somehow missed it) so there's no info about Xubuntu this time. GNOME version: Ubuntu 12.04 Precise Pangolin will continue to use most GNOME 3.2 applications but will use GTK3.4 and pick up some GNOME 3.4 components such as GNOME Games, Gedit and others. Some more important applications will remain at version 3.2 while applications not included by default in Ubuntu can be updated to 3.4. Also, gconf and GTK2 will probably remain on the CD. The reason for this is that Ubuntu 12.04 Precise Pangolin will be released just a month after the GNOME 3.4 release so there is not enough time to get everything ready. Also, Precise will be a long term release, so everything needs to be very stable. These are of course just a few of the possible changes in Ubuntu 12.04, but we'll have a more in-depth look when each change lands in Precise.